This week in the war, on 27 September 1943, the people of Naples rose up against the German occupiers who had been plundering the city and deporting thousands of citizens for forced labour in Germany. The uprising began in the afternoon when German soldiers were sacking a large department store in the city centre. The Germans retreated, firing at random. By the end of the day, the fighting had spread throughout the city, with local citizens opening fire on the occupiers from windows and the roofs of buildings. The uprising continued the following day and the Germans sent in tanks, several of which were disabled by the Italians freedom fighters. Barricades were hastily built and, despite a truce, the fighting continued for two more days until the Allies arrived on the southern edge of the city. 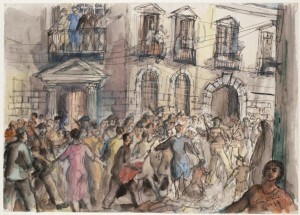 On the morning of 1 October 1943, the King’s Dragoon Guards entered Naples unopposed. The citizens of the city and the local Italian Resistance had already forced the German occupiers to withdraw—although not before the latter had destroyed much of the city’s infrastructure and factories, to say nothing of libraries and art. This entry was posted in World War II and tagged Italy, Naples. Bookmark the permalink.